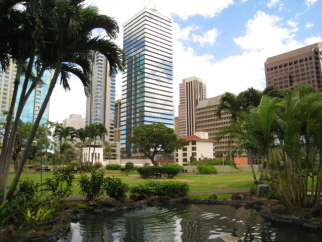 Just minutes from the Aloha Tower Marketplace and the heart of Honolulu with harbor, city and mountain views. One of the best kept secrets is the 2 acre private park on the third floor that includes the swimming pool, entertainment gazebo, walking paths, tropical flowers and trees, BBQ and picnic areas, and beautiful water features. Upgraded flooring and wall a/c. Savings based on companies that charge a 6% list fee.